For the actual cupcakes, you can use any recipe you would like, my favorites are strawberry cupcakes, vanilla cupcakes and chocolate cupcakes. All of those recipes taste just like a bakery made them. 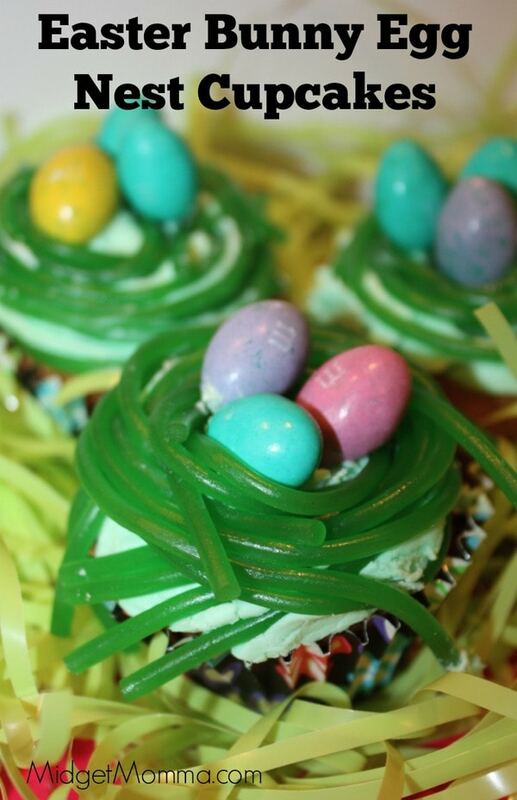 Here is also the recipes for my favorite vanilla buttercream – it is the only vanilla frosting I will use, that you will want to use when making these Easter Bunny Egg cupcakes. Let your cupcakes cool after baking. Make your green frosting – make this vanilla buttercream frosting and then add green food coloring to the color green you prefer. Pipe an even layer of buttercream onto the top of each cupcake. Using the green licorice laces make a “nest” on top of the frosting.